About 20 years ago, we started to landscape a bare piece of dirt and a very limited knowledge of horticulture. We started with a basic plan that became more and more elaborate as new ideas and our knowledge developed. 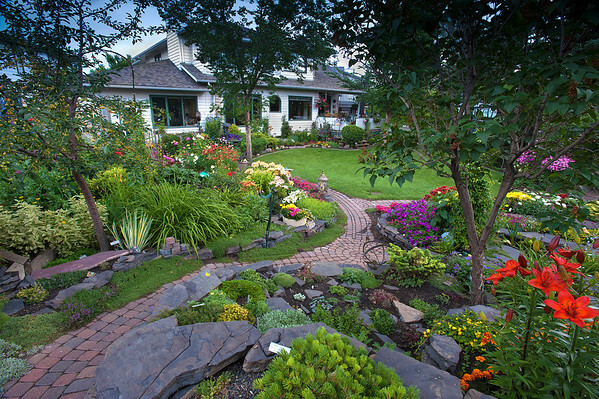 We used 23 ton of rundlestone rock to add flower beds and retaining walls, added a stream and fish pond, waterfalls, rod-iron gazebo, alpine garden, cobblestone walkways, and an outstanding workshop. We live close to the Bow River and have a exceptional variety of wildlife enjoying our creation. This gallery contains some of our favourite shots that we hope will give you an idea of what we enjoy every day.